After running across Wheel_Works Hi Jumper in his photos of his progress on his Baja under "what did you do to your buggy/baja today? " I was going to PM some other photos of my Hi Jumper to him. But I decided that others might be interested. So here are a few old race photos of the car. The car and I (and as you can see, a few friends, won a Championship in 1983 with AMSA, racing in the California Mojave High Desert in an unlimited class. Congradulations on the win. Nice pictures. What were the rail's specs. 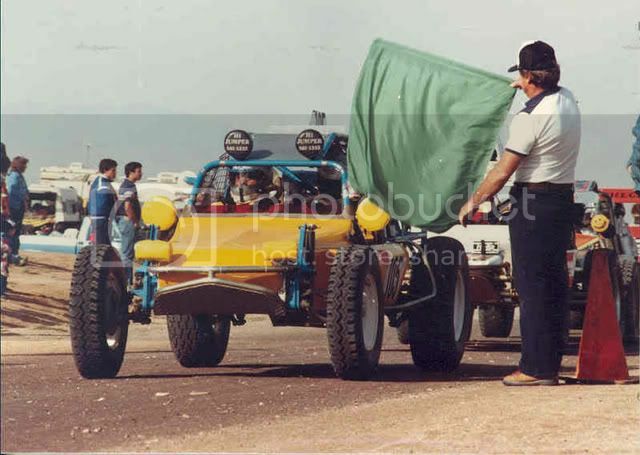 Starting off for a 1st in the 83 AMSA 12-hour race at California City which clinched the Championship! 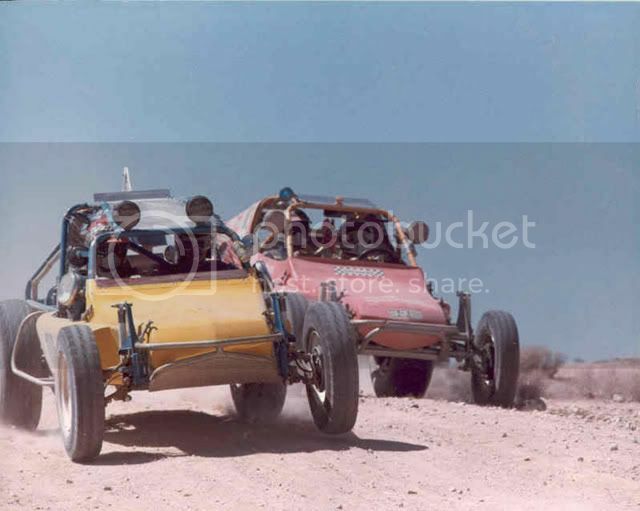 Passing a 2180 dual carbed chromoly frame car on the way to 2nd the next year (would have been 1st again if not for the co-driver endoing the car 25 miles after this photo) And I talked to the owner/driver of this orange car and his partner last weekend at the Glen Helen Baja Cup race. California City 250 84 - 1st in class. Subfreezing temps! At my buddy's shop a few years ago ready to head out with a bunch of others on a run in the neighborhood desert. Passing our Hodge Road remote pit straight toward the setting sun in the 80 Fireworks 250. 115 degrees in the shade. The Parker Pumper helmet made it livable. 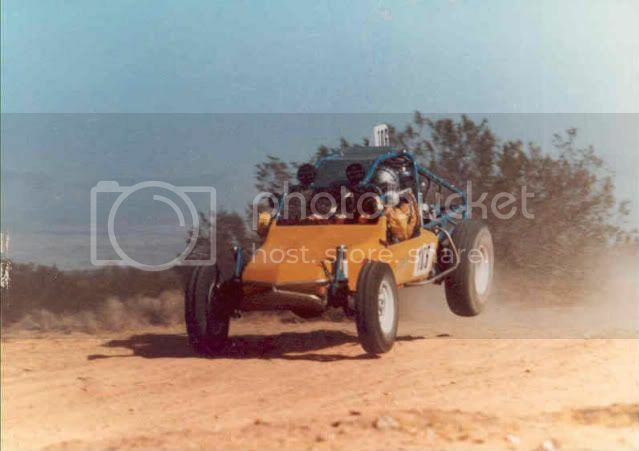 1st overall that day was the single seat buggy at the bottom of the front cover of the Hibbard book. I beat that same car in 84. - Motor mount brace straps 1/4" x 1-1/2"
- 65 VW beam cut and rotated 5/16"
That should keep you guys reading for a while~!!! Thanks for posting these pictures. 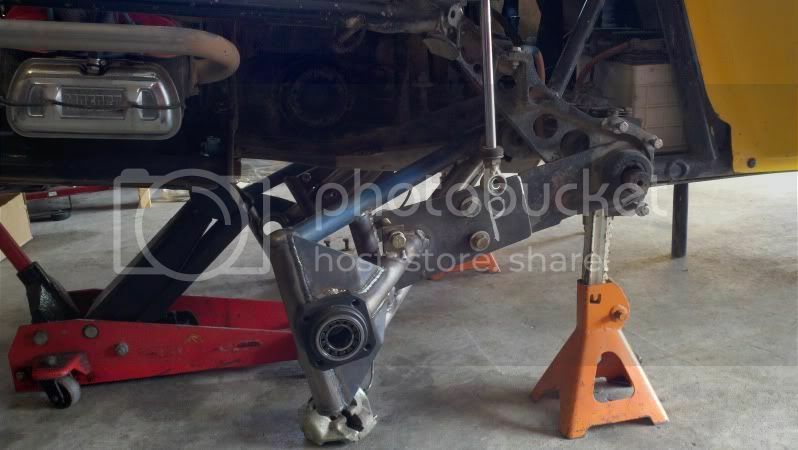 Ordered 3X3 rear arms and 2X2 fronts. Will also be ordering a Saco Rack here real soon. I will share pictures real soon here of the car. 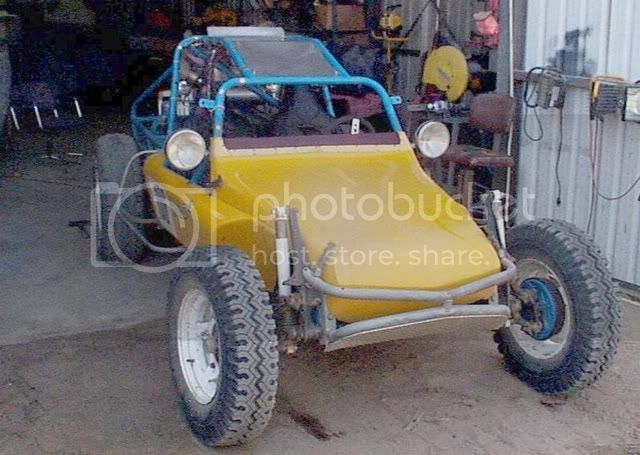 Yeah, I noticed your HiJumper off to the side in looking at pictures of your Baja project. Cool Baja. I'm glad to know that there is more offroad opportunities in MI than just Silver Dunes. 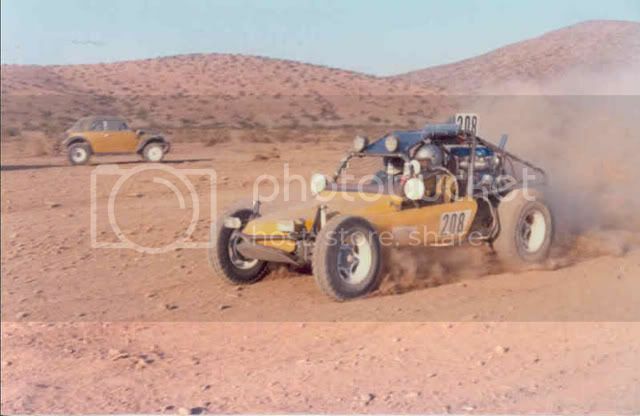 Living here in the Mojave Desert there are many offroad opportunities, though nothing compared to 40 years ago. A few years ago some offroaders from this little town in the desert moved to the Tennessee/Kentucky border area and after having sold their offroad vehicles here and moved, they learned of many trails in their new area and regretted having sold their buggies and such. I had the Ecotec in my Baja today and Back out. I have a 10* front mount on my trans and I have to remove it. Motor sits on a Viscous angle. 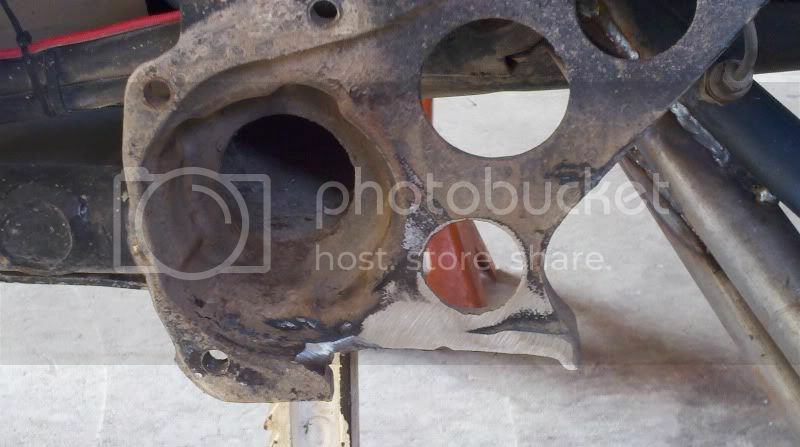 Kind of worried about the Oil sump. We have alot of trails and the system is gettting better. We ride the snowmobile trails alot too. I had the Ecotec in my Baja today and Back out. I have a 10* front mount on my trans and I have to remove it. Motor sits on a Vicious angle. Kind of worried about the Oil sump. I personally would opt for a more level installation. That may be achievable with some modifications to the 10* mounts. My HiJumper and probably yours was built with the whole torsion and forks rotated to 6*. Most people who were not original buyers seeing the info put out by the builder are entirely unaware of it. Most original buyers never paid attention to it. Here is a link to a discussion on another forum about converting an Ecotec powered Baja from a bus gearbox to a Weddle HV-1 where he discusses engine/trans mount angle. 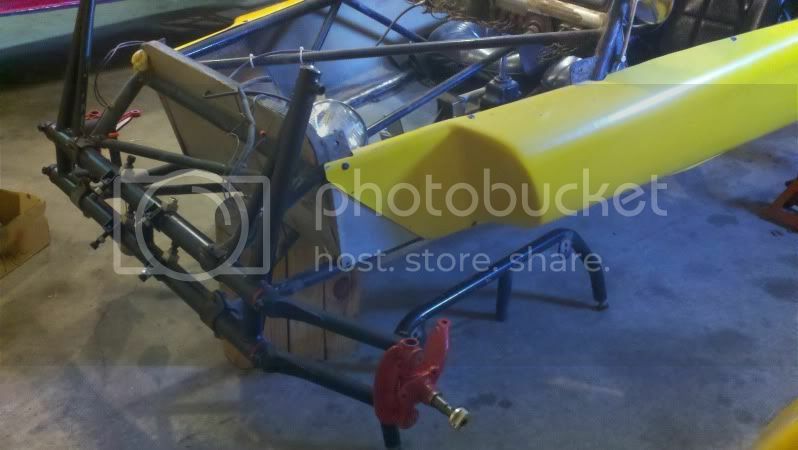 It hasn't been raced since the conversion yet, but I think it will work out excellent. The group includes some VERY bright and friendly people, some of the others are doing a similar swap on their own cars. If you have specific questions about it, I'm sure you'll get the info you need. Thanks. I'm a member over there also. Thats a sweet car. Thats what my next car is gonna look like. Been watching the Crumco car that have been popping up as builds all over the boards. Looks like the best bang for the buck out there. Been working on the Baja and the Hi Jumper @ the same time. I put the new 3X3's on my sons car, my fears were confirmed. With the 6* torsion it actually lowers the rear of the car and limits it to 6" of travel now. I cut the lower parts of the spring plate stop off and did some grinding in there. He has type 4 CV's. Sitting @ 22 * on the cv's he now has 12" of usable travel. Now I'm worried how the tires are gonna sit when all said and done. We love this car, might actually cut the torsion out and put a aftermarket Cromolly one in @ the proper angle. It's gonna be alot of refab work back there to do it rite. Now really sure it's worth it. I could also cut the inner pivots out and move those so the wheels will sit correctly all the way through the suspension travel cycle. What size rear arms are you running? Any Experience with anybody else and these problems? anybody have any pictures of stock Hi Jumper nerf bars? Im getting ready to build some for my sons car and wanna Duplicate Hi Jumpers as best as possible.